When Bruce Jakosky arrived at NASA's Goddard Space Flight Center outside of Washington, D.C. on Tuesday morning, the parking lot was full. But no one was there to work. The employees were busy resetting their voicemails and email responses. They needed to let the world know that the government, and therefore NASA, was shut down. Jakosky, a government contractor who is directing the next Mars exploratory mission, came in to make sure that the Mars Atmosphere and Volatile Evolution spacecraft (MAVEN) was safe in the clean room at the Kennedy Space Center in Florida, and that all on-board electronics were secured. By the time he walked out of the Goddard Space Flight Center around 1p.m., there were only three cars in the parking lot. The employees had all gone home. The government shutdown was in full effect. As an optimist, Jakosky never thought the shutdown would actually happen, he told CBSNews.com. Even standing in the empty parking lot, he felt confident the shutdown would be wrapped up within a day, and that the government would restore funding in time to ready MAVEN for its planned Nov. 18 launch. But today, as the reality of a potential extended shutdown began to sink in, he sounded more concerned. "After a week, I'm really going to start to worry," he said. As a contractor, Jakosky can continue working out of his University of Colorado office in Boulder. But the team in Florida that is supposed to be readying the spacecraft is on furlough. "I can still work. I'm focused on getting ready for science when we arrive at Mars. But the real work on the spacecraft has stopped. We are just under seven weeks to launch. We have tasks scheduled every day.... Every day we're shutdown does hurt," he said. Getting back to work is imperative because there is only a short window of opportunity to launch MAVEN. The spacecraft must launch by mid December at the absolute latest. After that, it will be 26 months before Mars and Earth are again properly aligned. The team has been working on this $650 million mission for more than 10 years. 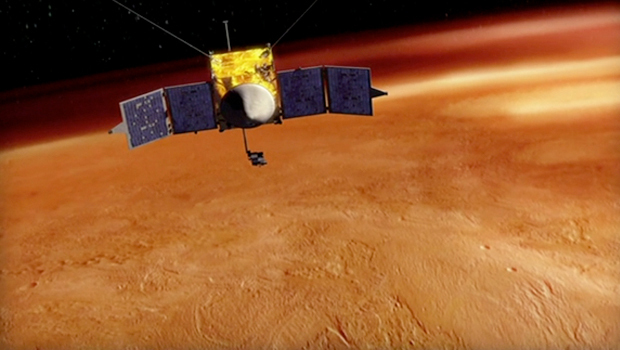 The plan is to study Mars' upper atmosphere to better understand how it has changed over time. Launching will only be possible if the mission team is able to get back to work at least a few weeks pre-launch. Remaining tasks include finalizing the thermal blanketing, solar arrays for flight, installing the pyrotechnic devices, loading the fuel, and moving the spacecraft onto the launch pad. The team is prepared to work around the clock, but, Jakosky said, "The key thing is we want to do things safely and correctly, because once we launch, we don't have a chance to fix it. So we don't want to hurry things." While the team has a 20-day window for launch, the window is meant to allot for weather and technical issues, not for delayed spacecraft readiness. If the MAVEN mission is delayed to 2017, there are research and budget ramifications. "Our science is tied to the solar cycle. If we launch this year, we're seeing the sun when it's reasonably active," Jakosky explained. "In 26 months, it will be at a solar minimum, which is a much less interesting time to be looking because there is less influence on the Mars atmosphere." The next time it will reach maximum will be in about 11 years. As for budget, the entire mission team will be kept on board as they await the 2017 window. "What we have to do is keep the existing team going for two years so we make sure the spacecraft is ready to launch. [I] haven't calculated it in detail but it's a significant chunk of money," he said. As Jakosky's team waits for the government to get back to work, he knows that the solar system isn't playing along. "That launch period opens in 46 days, whether we're ready or not."